Perfect host, good quality of services and fast respons and perfect locations. We love it and will come back again..
Angie made the place a dream and has been the best host we have had in our two week journey. She gave us hiking ideas, helped us do laundry and helped us find family activities. She was very attentive. Angie was an amazing host. She upgraded us to a larger apartment and checked in with us daily to see if we needed anything. The apartment was perfect: very clean, large, kitchen well stocked and a view to die for. We loved everything and will come back. The location and view were fantastic! Just breathtaking! I wish I had more time, the host Angie was wonderful- gave us tips on where to go and what to see. I want to go back for a longer stay! Angie - manager . Stunning view + nice balconies . 3rd floor was large + tv lounge great . 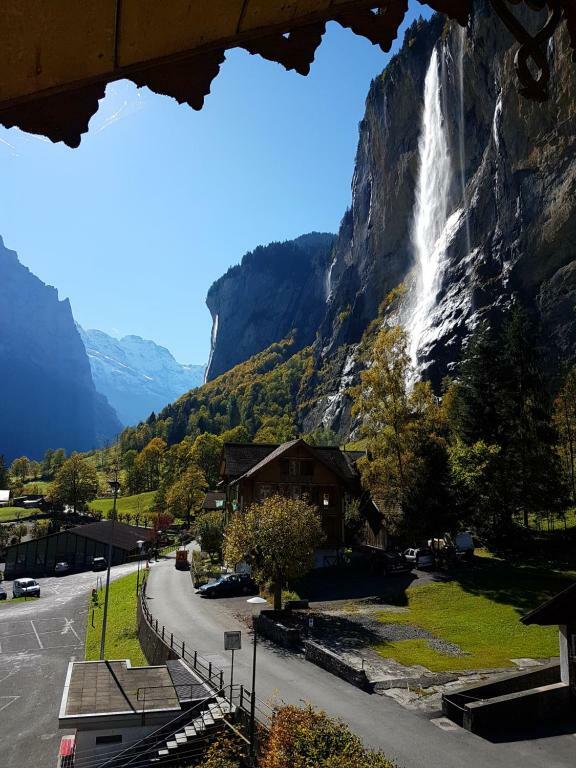 Wonderful place to base in Lauterbrunnen. This is one of the better accomodations we stayed in all our travels. It’s outdated in a GOOD Way. I will recommend this to my friends and family who are planning to visit in the future. Oh btw, the host Angie is genuinely frendly too!! Beautiful view of the falls and a very comfortable and homey apartment! And very affordable for Switzerland. I wish I had found this place years ago. Angie was super nice to us as well. Really recommend! Everything. Angie is awesome. I have to say I had high expectations after reading the reviews and she exceeded it. We came in early around 10AM. No problem, she let us check in. Gave us a bigger apartment then we reserved with amazing views. She provided a visitors pass that we could use on our trip and gave recommendations on where to go. Keys to the apartment were already in the door waiting for us to come in. She even offered to drive us to the train station after the stay. Just exceptional service. You can't ask for anything more. Angie was a great host! She met us at the apartment, explained everything, and provided a lot of information about the local area. The apartment was perfect, great location, beautiful views! Highly recommend this apartment! Lock in a great price for Hornerpub Apartments – rated 9.4 by recent guests! Hornerpub Apartments This rating is a reflection of how the property compares to the industry standard when it comes to price, facilities and services available. It's based on a self-evaluation by the property. Use this rating to help choose your stay! 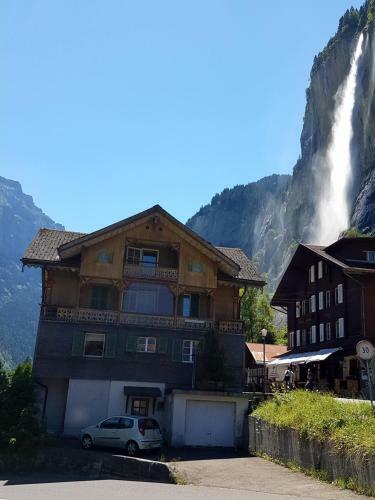 Lauterbrunnen’s Hornerpub Apartments is located just 650 feet from the Staubbachfall waterfall and the local bus stop. Accommodations at Hornerpub Apartments has a balcony or terrace with views of the Staubbach waterfall and the Lauterbrunnen valley. 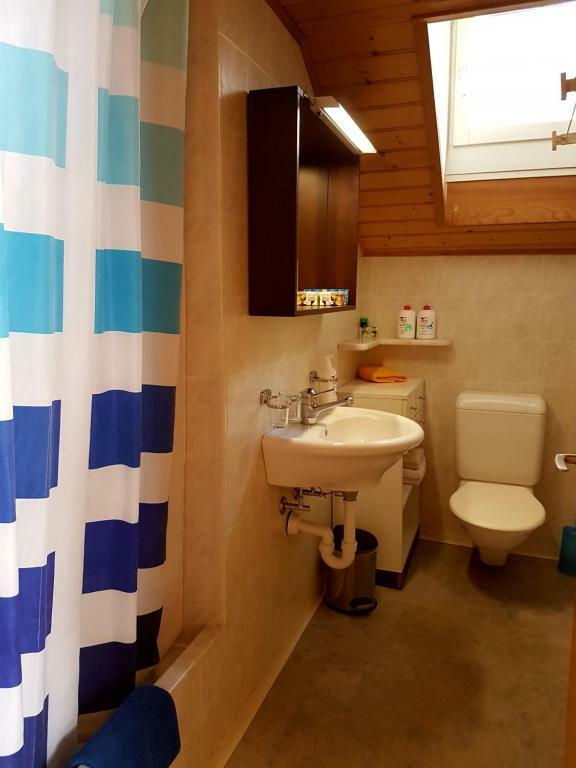 Units come with a kitchen, dining area, bedroom, a living room with cable TV, and a bathroom. The pub across the street serves snacks until 22:30. Parking and internet are available free of charge, and the final cleaning fee is included in the room rate. Hornerpub Apartments has a ski storage room. A bar with darts facilities is also available. Base jumping is a popular acitivity in the region, and a lively pub is located directly behind the apartments, which hosts late-night entertainment. Lauterbrunnen’s train station is a 10-minute walk away. This property also has one of the top-rated locations in Lauterbrunnen! Guests are happier about it compared to other properties in the area. When would you like to stay at Hornerpub Apartments? 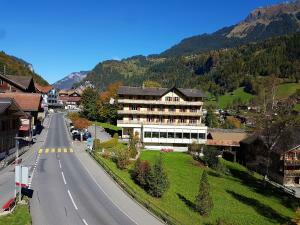 This apartment has a balcony with views of the Staubbach waterfall and the Lauterbrunnen valley. 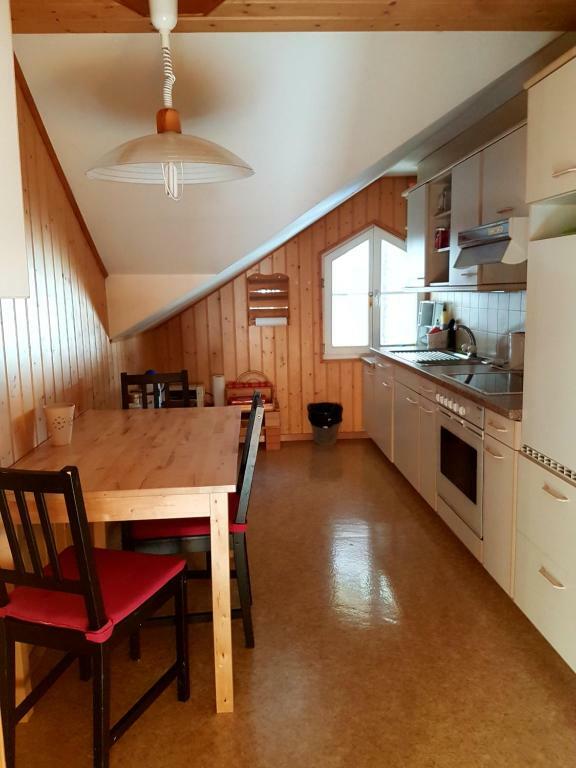 It comes with a kitchen, dining area, bedroom, living room with cable TV, and a small bathroom with wooden floors. 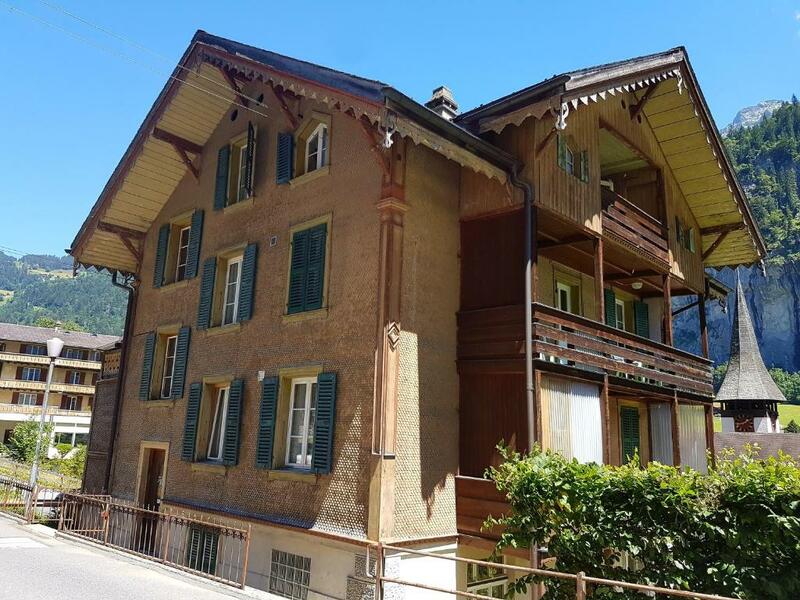 This apartment is very spacious and has a terrace with views of the Staubbach waterfall and the Lauterbrunnen valley. It comes with a kitchen, a dining area, a bedroom, a living room with cable TV, and a small bathroom with wooden floors. House Rules Hornerpub Apartments takes special requests – add in the next step! Hornerpub Apartments accepts these cards and reserves the right to temporarily hold an amount prior to arrival. Please note that there might be noise disturbances, as there are a pub, a public parking and a church next to the apartments. Please note there is no elevator/elevator in the apartments. The church bell rings on the hour even during the night. No fault of the property or owner. Angie did an amazing job! She is a great host. View was beautiful. Angie was so helpful about tourist attractions around area. Shower temperatures not so easy to regulate. The only thing we were missing was a hair dryer . The second night our hot water and floor heating went out, but Angie was very responsive and helped us get the problem resolved quickly. It was perfect. The only thing the host can improve is the WIFI. It's a bit slow. What a wonderful place. It exceeded our expectations. The host is sweet and always available. Easy check-in/check-out. We saw 2 apartments and they are in very good condition and very clean. We've got upgrade to a bigger apartment that was free. Angie is great and easy-going host.